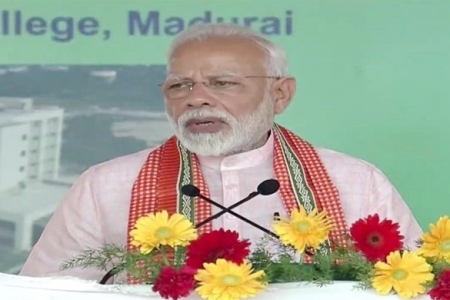 Prime Minister Narendra Modi will visit Madurai on Sunday, to lay foundation stone for the much awaited All India Institute of Medical Science (AIIMS) in the temple city. He will also inaugurate the super specialty blocks of Rajaji Medical College, Madurai, Thanjavur Medical College and Tirunelveli Medical College and will also address a public meting of the BJP. In view of his visit, Madurai and adjoining areas have come under intense police protection. Sources said a strong contingent of 5,000 police personnel will be on security duty at Mandela Nagar and at Vajpayee grounds where a public meeting is organised. Personnel from Special Protection Group, CRPF and CISF are also part of the security apparatus. It maybe noted that the Union Cabinet chaired by Modi had approved setting up of AIIMS at Thoppur in Madurai on 17 December 2018 with an approved budget of Rs 1,264 crore. The project is expected to be completed in 45 months by September 2022. AIIMS, Madurai has been a long pending project. The multi-specialty hospital will be a 750 bedded facility. It is setup with a long term focus on Post graduation and higher education and Research. It will have a capacity of 100 MBBS seats and 60 B.Sc (Nursing) seats.